Dentists using PlanMill can now benefit from an even larger range of Ivoclar Vivadent materials to produce their restorations. 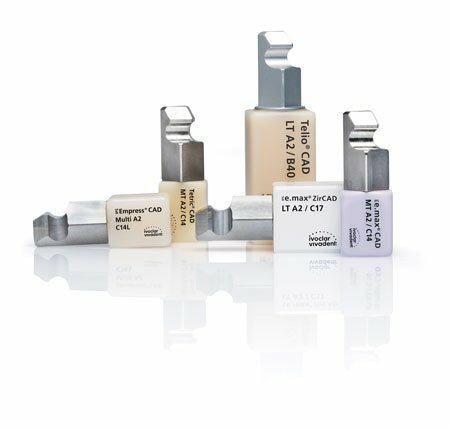 IPS e.max ZirCAD LT (low translucency) is a monolithic zirconium oxide block designed for crowns and 3-unit bridges. The material allows posterior crowns to be designed in a reduced wall thickness of 0.6 mm and anterior crowns in a reduced thickness of 0.4 mm due to its high mechanical strength of 1,200 MPa(a)and high fracture toughness of 5.1 MPa1/2(b). The reduced thicknesses increase the translucency of the restorations and benefit the esthetic outcome. A fluorescent effect can be achieved with IPS e.max CAD Crystall./Glaze Fluo. The restorations are placed using either a conventional cementation technique or a self-adhesive resin cement, such as SpeedCEM Plus.Sintering is carried out in the Programat CS4 furnace. The LT blocks are available in the shades BL, A1-3, B1-2 as well as in C2 and D2. IPS e.max®, Tetric®, Telio®, Programat®, SpeedCEM®and OptraGate®are registered trademarks of Ivoclar Vivadent AG.